Publisher: The History Press, 2011. Soft Cover, 256 pages, 6x9. 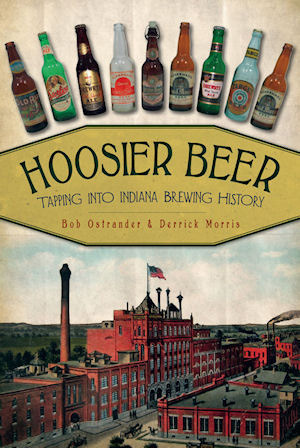 Crack open a bottle of Champagne Velvet and dive into the first complete history of brewing in Indiana, where the beer history is as old as the state itself. More than three hundred breweries have churned out the good stuff for thirsty Hoosiers, and this city-by-city guide gives readers a sample of every spot, allowing time to savor the flavor while sharing the hidden aspects, like the brave and hearty brewers who assisted the Underground Railroad and survived Prohibition. The unmistakable Hoosier personality and spirit shine in the classic labels and advertisements, many of which are displayed here in vibrant color. Join Indiana beer enthusiasts Bob Ostrander and Derrick Morris of hoosierbeerstory.com on a pub crawl through this state's proud beer history. Bob Ostrander is retired but has owned pieces of an Indianapolis bar and a Terre Haute brewery. He contributed to the IU Press book True Brew by Rita Kohn. Derrick Morris is a surgical technician, trained by the U.S. Navy more than twenty-five years ago. He has a strong passion for collecting breweriana (beer memorabilia) from his home state. He owns the world's largest collection of Indiana beer history. He contributed to U.S. Beer Labels by Bob Kay. He is a member of the Brewery Collectibles Club of America (BCCA), serving as a board member in 1993-94. Derrick's wife, Karen, attended the CANvention held in Indianapolis in 1996, and they got married in April 1997.